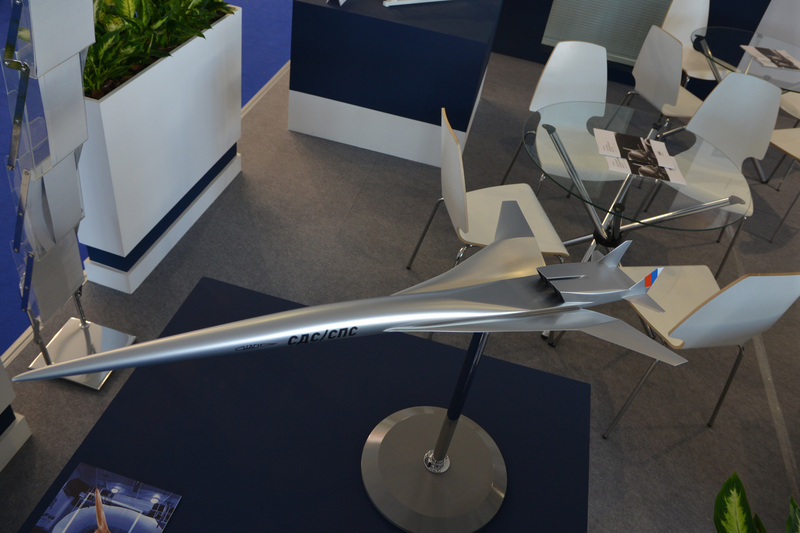 At the recently concluded MAKS’2017 International Aerospace Salon in Moscow, the Zhukovsky Central AeroHydrodynamic Institute (TsAGI) exhibited a scale model of its “Supersonic Business Jet/Supersonic Commercial Jet” (SSBJ/SSCJ). According to TsAGI, the airplane should be compliant with ICAO Chapter 14 noise levels and produce a sonic boom with intensity less than 72 dBA or 78 dB SPL (sound pressure level). The company believes the latter figures will make supersonic flight possible over land. The ongoing effort is a next step in long-term scientific research to produce “a two-regime” aerodynamic layout that would be efficient at both high-subsonic (Mach 0.80 to 0.90) and moderately supersonic (Mach 1.5 to 2.0) speeds, which TsAGI said is the key to success for a civil supersonic jet. The model exhibited at MAKS’2017 is optimized for cruise speeds of up to 1,133 knots (2100 km/h) and range of 4,000 to 4,640 nm (7,400 to 8,600 km), while ensuring landing speed does not exceed 162 knots (300 km/h). In addition, at the MAKS show TsAGI released images of a slightly different-shaped model being tested in the T-102 wind tunnel. TsAGI is jointly conducting its SSBJ/SSCJ studies with the Aviadvigatel and NPO Saturn Lyulka engine design houses. The Central Institute for Aviation Motors is also involved in the research into “advanced highly parametric dual-flow turbojet engines with regulated mixer and three-flow variable cycle engines” for propulsion.